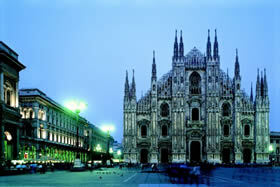 Milan is the capital of, and largest city in Lombardy, one of the northernmost regions of Italy. Considered a haven for bankers, businessmen, and fashion industry elite, many tourists may be inclined to skip over Milan on their way to the Como lake region. But Milan has much to offer the humble tourist. Even if your journey to the north of Italy is for the purpose of enjoying a few relaxing days on the lake, Milan is a city that is sure to delight you—be sure to leave a day or two to enjoy it. Milan is also the home of famed artist and scientist, Leonardo di Vinci's home. Learn about him at Milan's Museum of Art and Science. Other top art picks include the Poldi Palazzo Museum, which exhibits a broad collection of Italian works, and the famous Brera Art Gallery. But perhaps you've had your fill of art and are looking for something a little more active? Take in an authentic Italian football (soccer) game at San Siro, home of Milan's two professional football teams—AC Milan and F.C. Internazionale Milano. The stadium is magnificent—football fans and enthusiasts are sure to be amazed. Take the guided tour of the museum and stadium to get the full story. For a memorable evening, attend an opera at Milan's La Scala opera house. While the opera house is closed during the month of August, opera is otherwise featured year-round with July through September being the season for Classical music and ballet. Shows often sell out so it is recommended that tickets be purchased online, about a month in advance. Whether you consider yourself a fashionista or not, Milan's fashion and clothing industry is extraordinary. Internationally acclaimed as the fashion capital of the world, and home to the biannual Milan Fashion Week, this city knows how to create, wear, and sell haute couture. Take an afternoon walk through the quadrilatero della moda for a little window shopping and see what the jewel of the fashion crown has to offer this season. You might not be able to afford a new outfit, but windowshopping is free. If you've had your fill of pasta, you've come to the right place. The Lombardy region specializes in risottos (rice-based) and polentas (corn-based)—this is the place to try classic Northern Italian dishes like risotto alla milanese. 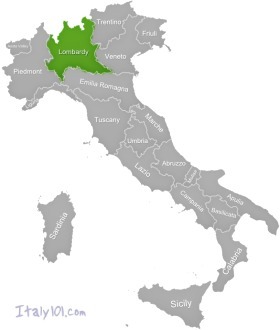 This region also favors their meats with bollito misto (a hearty beef stew flavored with chianti) and osso bucco (braised veal shank) being favorites of the place. If you consider yourself an especially adventuresome eater, order a plate of the fritto misto, a veal stew made of liver brains, lungs, and sweetbreads—this dish is a prized delicacy here. Panettone, the classic Italian sweet bread dessert, rounds off your feast. Planning to visit the Lake District? Take a train from Milan's central train station to one of the towns along Lake Como. Varenna or Como provide a picturesque lakefront setting for a few days of relaxation and rejuvenation. Take one of the slow boats for a scenic ride across the lake. When you return from your boat ride, stroll around town, head out for a leisurely dinner, and then turn in early. Though you might catch an occasional outdoor evening concert, the towns in the lake region are notoriously sleepy. Don't feel guilty about not seeing any sites! To get to Milan, fly directly into the Malpensa Airport and then head into the city's center by taxi or by catching the Malpensa Express, which will take you to the Cadorna train station. If you are planning to arrive by train, you'll arrive at Milan's central train station. If you are planning to visit any of the towns in the Como region, you'll catch your trains here. 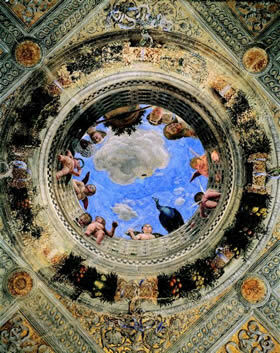 Lombardy, Mantua - Ducal Palace, the breathtaking ceiling of the Chamber of the Wedded Couple (Camera degli Sposi) by Andrea Mantegna. 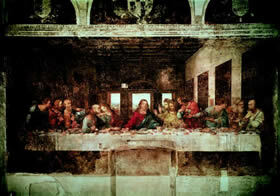 Lombardy, Milan - the genius of Leonardo da Vinci has left us an unforgettable Last Supper. 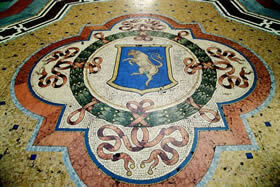 Milan - the bull in the Galleria Vittorio Emanuele, a victim of locals and foreigners in search of wealth and good fortune. Milan - the Duomo, 135 bold spires constructed over five centuries of labour.